Roses? Rubies? 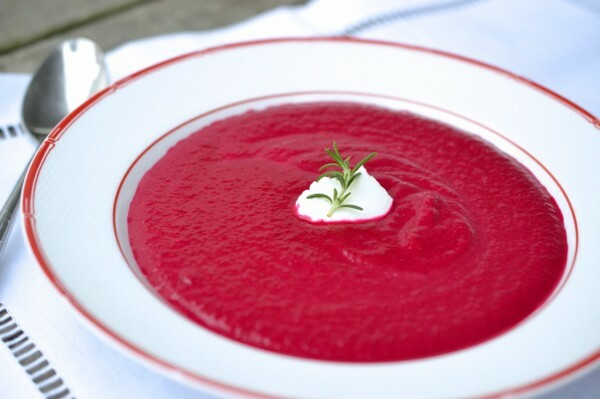 If you want to show Mom some truly brilliant shades of red and pink for Mother’s Day, serve her some beets. That’s right, beets. 1. Bring the vegetable stock to a boil in a medium-sized soup pot. Meanwhile, scrub the beets, peel off any rough edges, (it’s OK if you leave on a little bit of skin), and remove the tops. Chop the beets into roughly 1- to 2-inch cubes. 2. Add the beets to the stock, return to a boil, and then lower the heat to a simmer. Cover and continue simmering for about 45 minutes or until the beets are soft. 3. Let the beet mixture cool slightly, then puree in a food processor until smooth. Add the yogurt and salt and continue processing until evenly pink. Chill soup until serving. Garnish with additional yogurt and rosemary if desired. Serves 4 to 6. My mom would totally love this soup. I might even like it and I am not a big fan of beets. It is beautiful Jeanne! I can’t believe how bright red this soup came out! =) Thank you for sharing! Thanks, Nick! It was delicious! The mom on this coast loved it. I thought you used sour cream but certainly more nutritious with Greek yogurt. Hope you make it again soon for the family. Thanks, Bobbie! Good memory! Yes, I used sour cream at first but I tweaked it a few times since then. I also put in a little bit less than I did at Passover so it’s more red than pink this time. Still tasty! Yes it was delicious!!!! We were fortunate to have Jeanne serve this at our Passover Seder.